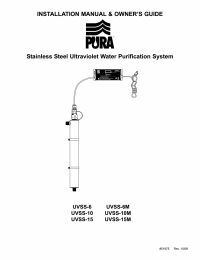 The PURA 89516 Control Module is designed for all UVSS Monitored models provides power to the system while simultaneously monitoring the 254nm wavelengths of the UV lamp output percentage. Unit also displays a 365 day lamp life countdown and produces an audible alarm when system is outside normal operating conditions. For the non-monitored UVSS models (no sensors) UVSS-6/10/15, use Control Module 89515.